Not only are we in a disorienting period between eclipses, but there are several inconjuncts this week that could present anything from annoying frustrations to major challenges. The inconjunct, more correctly called the quincunx (try saying that three times fast), is a 150-degree angle between two planets or chart points. Inconjuncts can be problematic, because the signs involved have little in common. It’s like putting an Army lieutenant and a ballet student in the same room and expecting them to find something to talk about. I don’t normally include inconjuncts in my forecasts, but in some circumstances, they can be very powerful, and they are indeed the dominant theme for this week. The week begins with a conjunction of Mercury and the Sun in Cancer on Monday. Normally I’d say this would be a good time to talk about feelings, but you may find yourself all over the map emotionally as the week progresses, and then you’ll have to back pedal or exhaust yourself trying to explain what you really meant, but in fact you’ve changed your mind since then anyway. You get my drift. You’ll be better off just sitting with your feelings and taking note for future reference. Write in your journal or talk to a trusted friend. Then we go right into inconjunct territory, starting with Mars in Gemini and Pluto in Capricorn. Whatever you’re trying to move — whether it’s furniture, packages, paperwork, your car, your physical body, or a point of view — you may get that “trying to herd cats” feeling. Moreover, when Mars and Pluto make contact, the ensuing power struggles can get ugly. 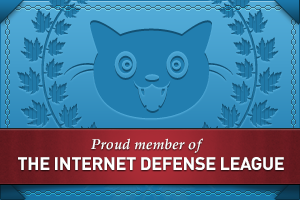 If you’re up against any kind of authority, do your best to keep a low profile. The next set of inconjuncts, which is active from Wednesday through Saturday, involves the Sun and Mercury in Cancer inconjunct Jupiter, Chiron, and Neptune in Aquarius (what Neith affectionately refers to as “Neptune & Co.”). I don’t even know where to start sorting this out. All I can say is that we may have to deal with a disparate jumble of information, events, situations, and people, with no idea which end is up. I suspect this might end up feeling something like Mercury retrograde. It wouldn’t hurt to apply those rules this week. Be sure to confirm, clarify, repeat back what you think you just heard, and, above all, forgive. Everyone is on stress overload. That said, we may get a pleasant surprise when Mercury trines Uranus on Wednesday and the Sun trines Uranus on Saturday. In the middle of all that confusion, something good will come through that will put a smile on your face. Mercury enters Leo on Friday and immediately forms another inconjunct involving Pluto. Mercury in Leo is not a lot different than Mars in Gemini, perhaps just a bit less forceful. No matter how badly your ego is bruised, if you’re dealing with someone in a position of power, be it the judge in traffic court or the grandmother who’s paying your college tuition, bite your tongue. If you need something, remember that you’ll catch more flies with honey. The Moon enters Cancer late Sunday, and then we’ll be in the final countdown to the total eclipse of the Sun at 29 degrees Cancer on July 21. I’ll have more in next week’s forecast, and Neith will post a report on Saturday, if not before. Check back often. Lots of love, and chins up! 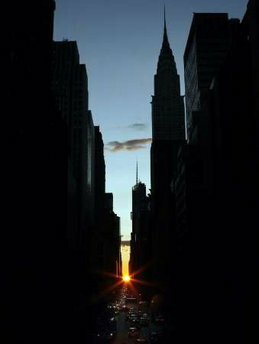 Image: The sun sets on July 12 during a biannual phenomenon dubbed “Manhattanhenge,” when the setting sun aligns with the east-west grid of Manhattan’s streets. At least something is lined up this week! Photo by Mike Segar for REUTERS. This entry was posted in About astrology, Forecasts and tagged inconjunct, Jupiter-Chiron-Neptune conjunction, Pluto in Capricorn on July 13, 2009 by Pat. A brief note on what’s happening in my life: my Aries spouse was in an accident, totaled his pickup but thankfully, emerged with “minor” injuries [cracked ribs, deep bruising, etc]. Between taking him to Dr appts, talking with insurance reps and keeping him quiet (biggest challenge with Aries) as well as helping with irrigating our pastures & garden, I am and will continue to be pretty much swamped. Sure does seem like Full Moon eclipse falling in my 2nd-8th houses [with the solar eclipse next week in my 8th house] to me! Ironic that just when we really need the income (we’re both self-employed – no sick pay) I have no time or energy to do reports. Apologies to those on my list . . .
Great lesson in what is truly valuable though – my Aries is still alive and kicking. Am so sorry to hear about your husband’s accident. Hope you two bounce back soon! Yes, yesterday was just like Mercury Rx. Grrrrr. Very frustrating. But very. Almost had a tantrum. Hopefully things will work out today. Thanks, deb! Amazing how even Aries will follow the doc’s order for rest when it hurts enough. I figured we’d have one setback where he overdid it before he’d get serious about no lifting or bending. You were right about “pirates” too. the towing co is classic . . .
Dispute any unfairness if necessary. You guys really seem to be in the “wars”. Hope Pat and Neith’s OH all fully recover soon. Love the articles on the eclipses as it follows on the heels of all the writing you both have done over the last 18 months since I started following your blog. Great for me with all my 1st/7th issues to sort out, finally coming to a grand conclusion with the big one on the 5th August (also on my Natal Sun). The new series on the Cap/Can axis is on my AC/DC (17 Cap/17Can) so still 1st/7th with 12th/6th thrown in just for good measure. This astrology stuff just gets more interesting as time goes on. Hold onto your hats and see you the other side of the rollercoaster. ,,, yesterday was just like Mercury Rx. Grrrrr. Very frustrating. But very. Almost had a tantrum. You and me both, Mem! Implosion was more like it. And is anyone else experiencing the heavy road construction in their area that we have here in Seatte? OMG, it’s as though the whole city is torn up. Pluto Rx in Capricorn on steroids. Getting around is very frustrating. Hope you all are hanging in there. Yeah! I’m over on the East Coast. But what the hell IS that banging noise outside? Sounds like someone’s made a bongo drum out of a sanitation truck! In other news, dare I say that my computer is as slow as it is in just about any Mercury Rx period? Very well. It’s slow. On the bright side, at least my connection isn’t booting me off the web every five minutes.